The Magellan Trail is in the BLM Bangs Canyon Management Area near Grand Junction, Colorado. 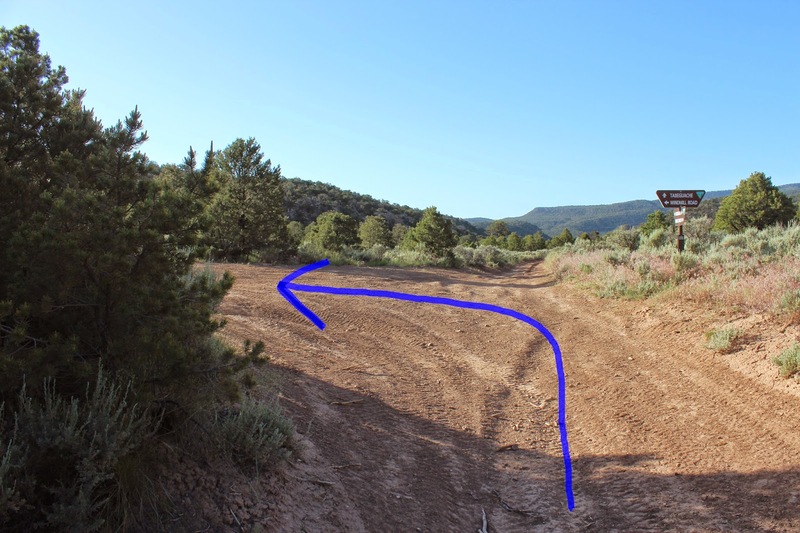 By combining a section of the Tabeguache Trail with the Windmill Road, Third Flats Road and Little Park Road a big loop is made that pretty much takes you around the world of the Bangs Canyon area. The entire length of the trail follows 4-wheel drive routes so it is all double track. 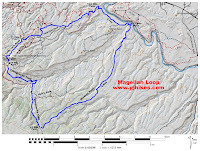 The Magellan Trail is part of the 3 day long Grand Junction Off Road , an endurance mountain bike event, now being held in Grand Junction around Labor Day weekend featuring challenging rides that start and finish on Main Street with live music as part of the entertainment. The trailhead at the Bangs Canyon Staging Area is about 8 miles from the intersection of 3rd and Main St. in downtown Grand Junction. 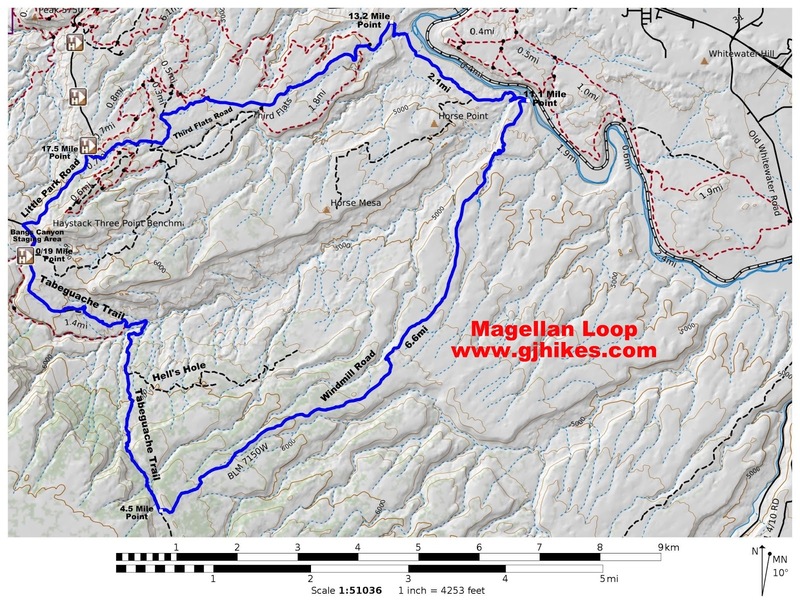 This post follows the Magellan Loop in the counter-clockwise direction. Some mountain bikers prefer to go the opposite way thinking that the climb up the Windmill Road is preferable to the Cross Canyon climb. 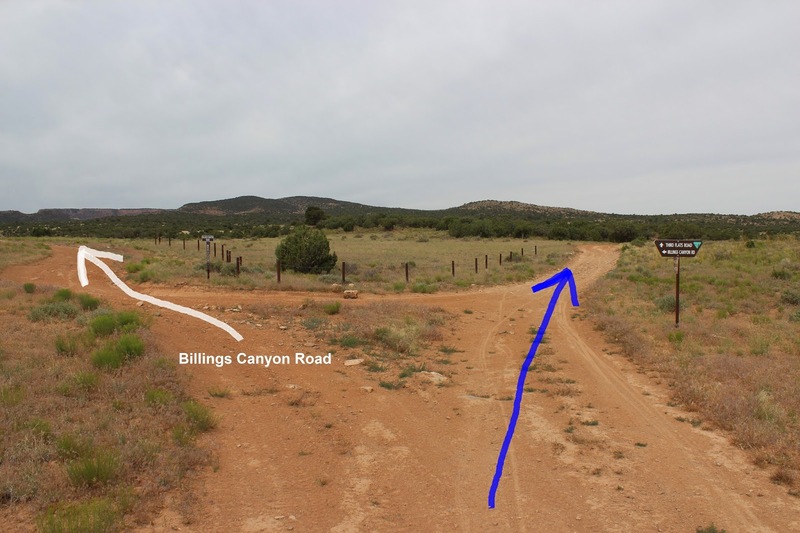 An alternative to parking at the Bangs Canyon trailhead would be the parking area across Little Park Road from the Third Flats Area. This profile of the almost 3500 feet of elevation gain gives an idea of how the loop looks hill wise. Beginning at the Bangs Canyon Staging Area on the left the route follows the Tabeguache trail down to the Rough Canyon waterfall, at mile 1.8, where it crosses the normally dry creek, and begins climbing along Cross Canyon at mile 2.1. 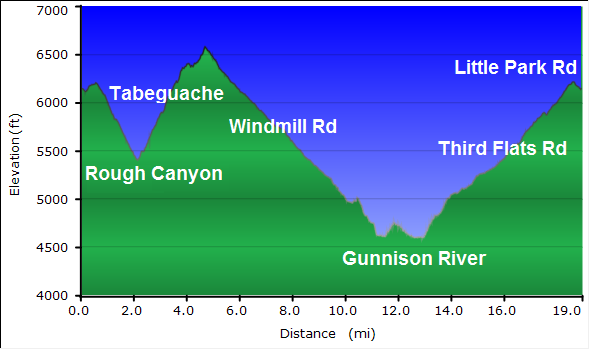 At mile 4.6 the route leaves the Tabeguache trail and follows the Windmill Road east. After 6.6 miles of mostly downhill rolling the route turns north along the Gunnison River at mile 11.2. Near the 13 mile point the climb away from the Gunnison River begins along the Third Flats Road. Little Park Road is reached at 17.6 miles and followed back to the trailhead at the Bangs Canyon Staging Area. Within a quarter mile of the trailhead the Billings Canyon Road departs on the left. The Billings Canyon Road leads to the Billings Canyon Extreme Jeep trail, after 3.8 miles, but it also continues on past there and connects with the Third Flats Road. The Billings Canyon Road could be used as an alternate route on the return trip to avoid the ride along Little Park Road. With a distance of 4.4 miles the Billings Canyon route would lengthen the loop from 19 to 20 miles. Much of the descent into the Rough Canyon/Cross Canyon area is slickrock. 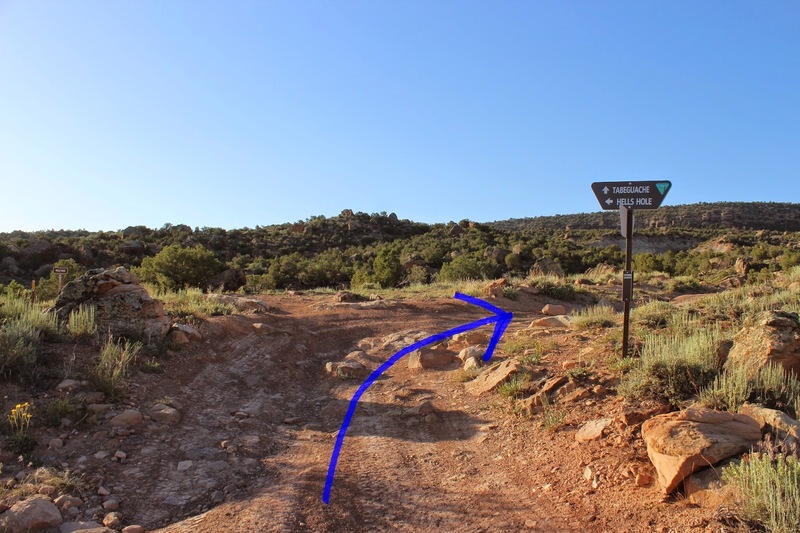 The 2.5 mile climb along the Cross Canyon section of the Tabeguache trail has several pretty steep sections but there are also stretches of climbing that aren't all that bad. Continue on the Tabeguache trail past the Hell's Hole Road near the 2.8 mile point. Just under 4.6 miles the route turns east and follows the Windmill Road. The initial tenth of a mile or so is uphill but after that it is almost all downhill to the river. The trail gives up 1,978 feet of elevation over the course of about 6.5 miles. A hill near the bottom of the run requires about a 50 foot climb to get over. After reaching the Gunnison River the trail meanders around a little and then climbs over a bench that sits about 150 feet above the river after which it continues north with a slight downhill slope. Continue past the Horse Mesa turnoff. The BLM has really spruced up the area with some new signs that take a lot of the guess work out of the route finding. At 13 miles the Third Flats Road is reached and the climb up to Little Park Road begins. The steepest section is up an initial switchback and past the junctions of the Butterknife and Art Cooks View trails. The Billings Canyon Road comes in near the 15.2 mile point. This is the alternate, but 1 mile longer, route back to the trailhead that avoids Little Park Road. At about 17.6 miles Little Park Road is reached. The route from here continues to climb in elevation but since the road is paved it is probably easier. A persons legs might be too tired at this point to notice the difference. The Magellan Trail is a nice ride even if it is all double track. While there are no real technical sections to deal with it requires a lot of stamina. The scenery is pretty and it is nice to venture into a different area. The long distance of the trail cuts down on the number of other riders. We normally see more jeeps and ATV's in the area than anything else although on this outing we only encountered 1 ATV but saw 4 mountain bikes. If you would like to see it for yourself then all you have to do is grab your bike, or other toy, or 'Take a hike'.